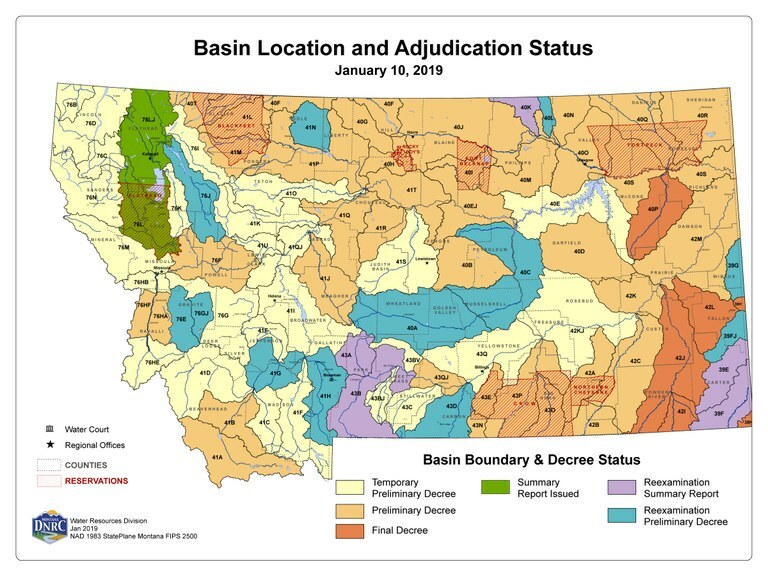 The Water Adjudication Bureau assists the Montana Water Court in the adjudication of all claims to pre July 1, 1973 water rights. The Bureau examines all claims pursuant to Supreme Court rules and provides a summary report to the Water Court on each of the basins (85) in the state. Pursuant to legislation passed in 2005, the Bureau completed the examination of the remaining 57,000 claims (as of 2005) by June 30, 2015 and must provide summary reports to the Water Court for the remaining 30 basins by June 30, 2020. As of July 1, 2015, the Bureau is responsible for the reexamination of 90,000 claims in 44 basins. These were previously decreed under the verification process and not the claim examination rules. In accordance with SB57, which sets certain benchmarks for the Bureau, all reexamination of these basins are to be completed by June, 30, 2023. The Bureau is required to report progress quarterly to the Water Policy Interim Committee (WPIC). The Bureau also provides post decree assistance to the Water Court as requested and to District Courts as Water Court decrees are placed under enforcement (upon petition to the District Court).